At machine level the machine data acquisition (MDA) acts as an interface between the production equipment and the higher level information processing (ERP, PPS). It allows you to automatically collect production data (e.g. production quantities, scrap), as well as process data (e.g. the power consumption of a machine). FACTORYMINER offers you a high degree of flexibility and scalability regarding the connection of different types of machines. The machine data is logged to the second and is available for a variety of analysis in real time. The machinery of production sites has usually grown over the years and thus is commonly inhomogeneous. It typically consists of various machines from different manufacturers with diverse interfaces. This leads to very special requirements for machine data acquisition. FACTORYMINER is designed for maximum flexibility and scalability concerning the connection of machines. Thus, it is fully prepared to meet your specific requirements. 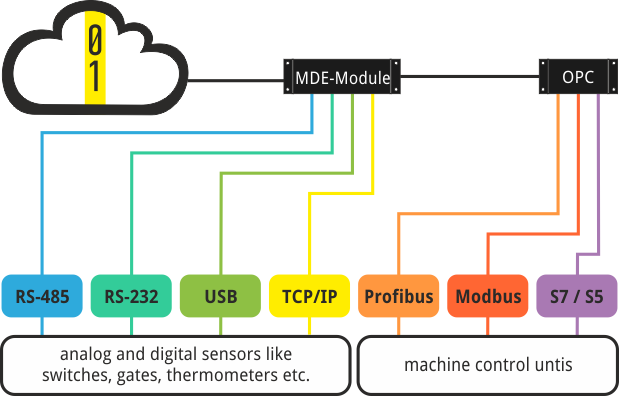 Machine data can be collected via digital outputs or machine control units from virtually any machine. 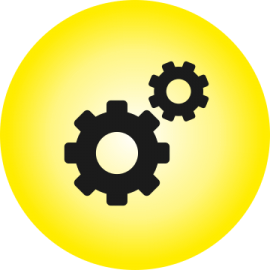 This makes FACTORYMINER to your solution for machine data acquisition—whether for discrete or continuous productions, for linked lines, or individual machines.